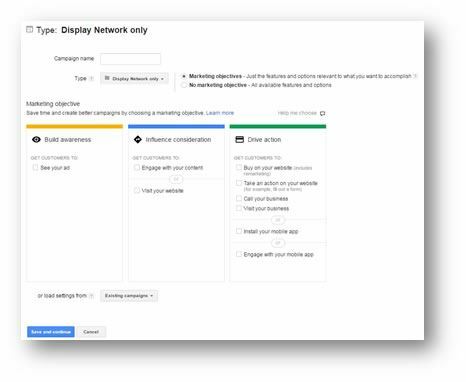 What are Display Network Only Campaigns? Why Use Display Network Only Campaigns? This guide is an introduction to Display Network Only Campaigns, how they work, what they are used for and the components specific to them. We do not cover any features or components that are used across all campaigns, such as budget, campaign name, etc. The Display Network is a collection of over a million websites that allow ads to be displayed on them, these can range from popular websites such as News.com.au to travel blogs, mobile apps and more. This provides advertisers with the potential to reach upwards of 80% of the worldwide internet users with their ads. 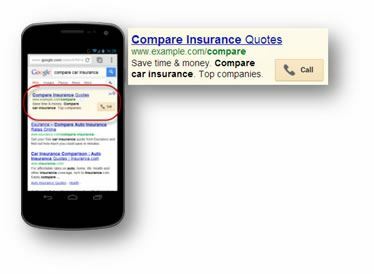 Display ads appear on websites around the internet (see example in the above image) that have AdSense installed, allowing Google to access and show ads to users who visit those webpages. Typically, CTR (Click Through Rate) will be much lower than on the Search network where you may expect to get CTR of 2% or higher… On the Display Network you can expect a CTR of 0.1% or higher. Display network are often less qualified than Search Network users just as an intrinsic component of how and when they are clicking ads. That said, the traffic is more often cheaper on the display network creating a greater balance between cost and value. The vast numbers of people that see Display Network ads means that the Display Network can offer a different type of marketing strategy to Search campaigns. Search Network campaigns are typically ‘direct response’, but Display campaigns can facilitate both this and ‘brand awareness’ marketing. Whereas on the Search Network you are penalised for poor CTR, on the Display network you can target Impressions instead of clicks, if you want to. This enables you to allow more people to see your ads; and because you can create image or animated ads in addition to many other more advanced and engaging ad formats, you can deliver a much more effective brand awareness campaign. Display campaigns also allow for some unique targeting methods such as remarketing, which allow you to market to user who have visited your website previously. 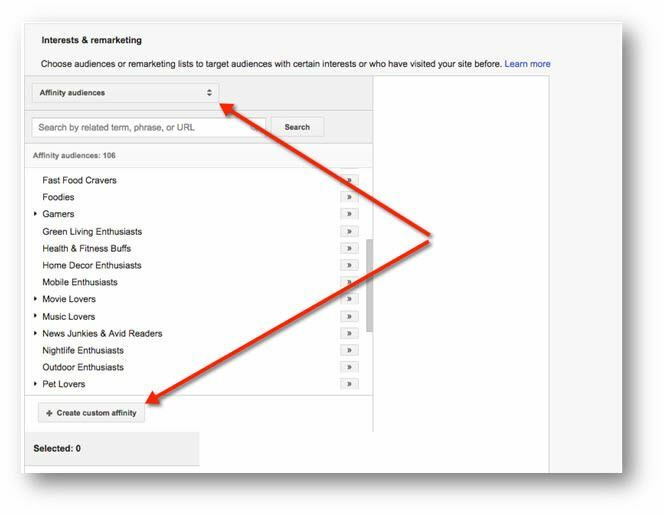 You can even target similar users to those in your remarketing lists. Consequently, there are many reasons why you would want to use Display Network Only Campaigns, depending on your business objectives. Getting your ads on popular websites and within relevant sections of those sites can deliver high volumes of cheap traffic and allows for new forms of account expansion. 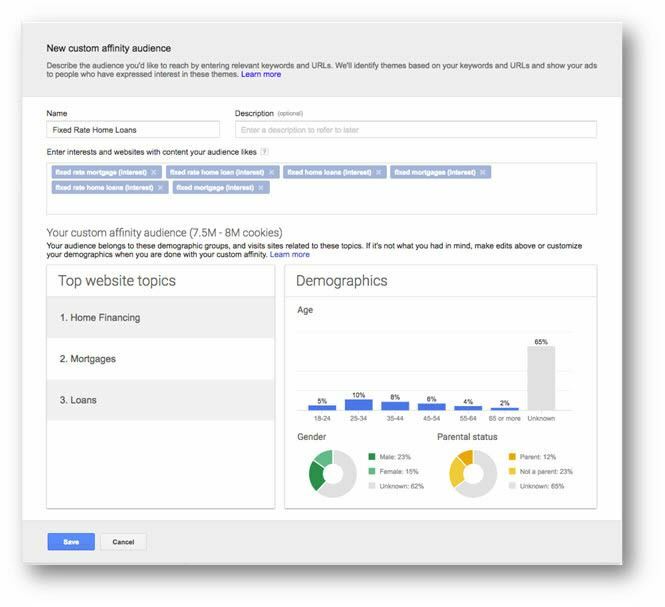 Advertisers that want to improve their brand or product awareness would be suited to this AdWords marketing objective. 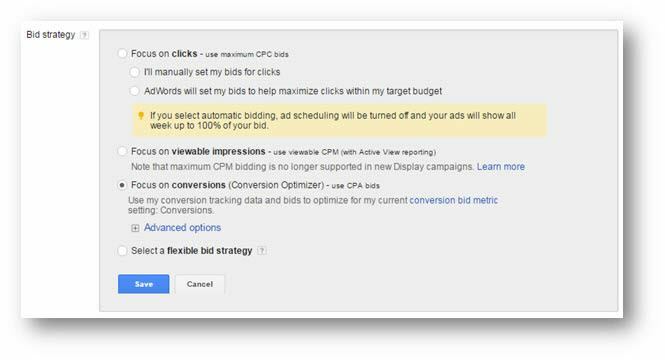 This campaign sub-type will maximise for exposure and allows ‘Viewable CPM Bidding’ which is explained later in this guide. This sub-type would be valuable to new businesses or new products for businesses that are expanding into new areas. Brand awareness campaigns can have an impact on CTR of other ad types as users will be more familiar with your brand or product. Thus trying to measure uplift or performance increases in other areas when using this campaign type can allow you attribute greater value to the Display Campaign. The primary aim of this campaign sub-type is to get as many users as possible to see your ads. This campaign sub-type allows features that assist potential customers to find product options. A good example of this would be using ‘Affinity Audiences’ and target them with engagement ads or another rich media ad format. Using the method, you can also use engagement bidding, whereby you only pay if a user engages with your ad, making this an attractive and cost effective channel. Using ‘Drive Action’ on a Display Network Only Sub-Type is more direct response, the aim is to get the user to start the purchase process or convert. This also enables you to use the conversion optimiser to improve campaign performance using an automated tool. These campaigns are typically CPA (Cost per Acquisition), ROI (Return on Investment) or ROAS (Return on Ad Spend) driven. As such you typically will be required to setup conversion tracking and conversion values if you’re not using eCommerce tracking. This campaign sub-type ‘does what it says on the tin’… It enables all features available on Display Network Only campaigns. This includes all ad formats, targeting methods, bidding strategies, ad extensions, etc. All of these components are discussed in other parts of this guide. For experienced users this offers the most flexibility and choice but can be more confusing for advertisers with less experience or knowledge. If you know what you are doing and don’t need Google’s help, choose this sub-type. The default is to target all operating systems, mobile devices and carriers, but you can customise this here if you have specific needs. Apps are a part of the display network and a lot of people use apps every day, so this is a large and targeted channel for advertisers. You can also narrow targeting down by adding in additional criteria such as age, gender, etc, which will reduce impressions but allow for greater accuracy when reaching you target audience. This campaign sub-type would suite advertisers looking to promote their own app, content, services, and products relevant to apps and the app users. We have listed all of the ad types available on Display Network campaigns and across all campaign sub-types below. 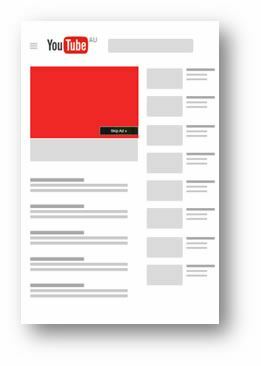 Texts ads are clickable links that deliver traffic to your website. Ads are the account components that are shown to users / searchers making them unique in that respect. All other account components, such as keywords, campaigns, ad groups, etc. are not things people can see. 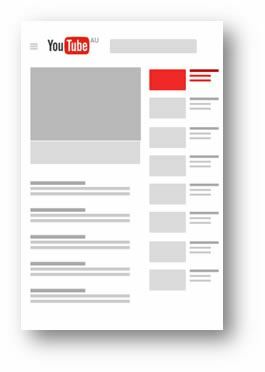 Image ads are simply images that you have created to appear on Display Network sites and are clickable links to landing pages on your website. Image ads are only available on Display campaigns and ads on the Display network differ at a fundamental level in their delivery to ads on the search network. 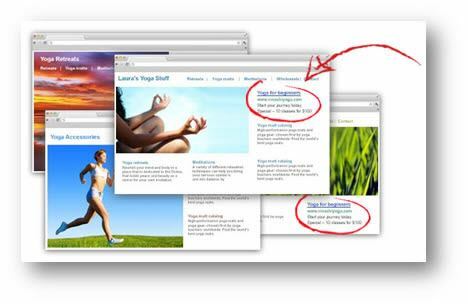 The display network allows you to use text and image ads, but they are built in very different ways. As well as driving clicks, image ads are also more compelling ads used in branding or brand awareness campaigns. Click the link to find out more about Image Ads. Lightbox ads are a new ad format, which is part of the rich media group of ads, they are more engaging and utilise existing resources from existing advertising campaigns. You can use vCPM (Viewable CPM), which is a viewable cost per thousand impressions billing method instead of CPE (Cost Per Engagement). Rich media ads can be used for Gmail Advertising, Mobile and Tablet advertising and a they have a host of applications on the Display Network. 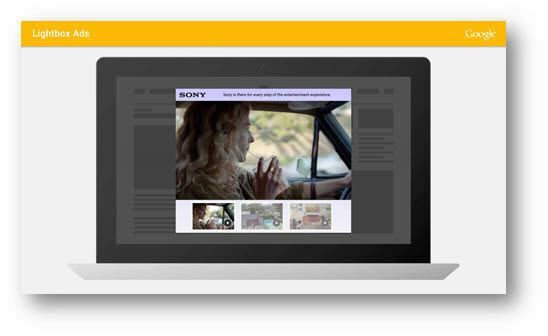 Click a link to find out more about Lightbox Ads, Engagement Ads, or Rich Media Ads. If you have used YouTube, you have likely seen TrueView ads as they are the video ads that appear before some videos play, typically you can skip them ads after 5 seconds if you are not interested. This is one of two formats that TrueView ads come in. We describe here only the bid strategies that are available on Display Network Only Campaigns in this section of the guide. Different bidding strategies provide their own advantages and disadvantages but are typically designed to meet specific need of the advertiser, or make it easier for them. The default here is ‘Manual CPC’ which refers to manually controlled bidding. Bid strategies can be applied to ad groups or campaigns. For example, if you apply the same Target CPA bid strategy to three campaigns, each individual campaign could be above or below CPA but the aggregate or collective CPA across all campaigns should be close to the target. The display network is characterised both the range of ad formats and also the targeting options available to advertisers, each of which we describe below. 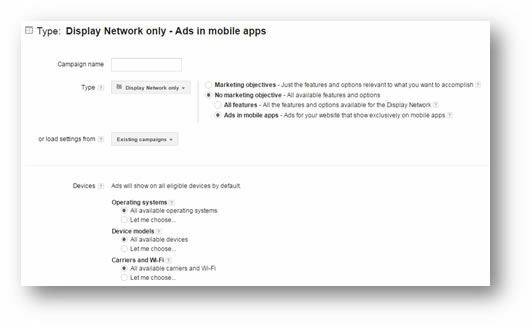 Targeting Options are applied at the Ad Group level rather than at campaign level, but these are intrinsic to the Display Network, which is why we cover them briefly here. For more detailed information on each of these subjects please follow the links provided in the following sections below. Keyword Contextual Targeting matches your chosen keywords (within the campaign) with content from webpages on the Display Network. 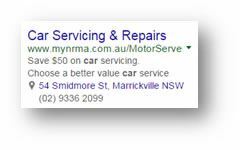 It is on these matched pages that your ads are eligible to appear and be seen by users. This type of targeting relies on Google’s ability to determine relevance between page content and your keywords, you can curtail this with negative keywords. 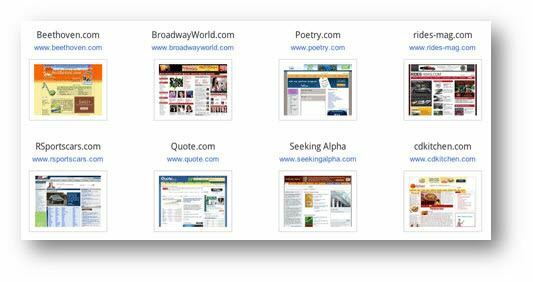 This is a great way to identify websites and webpages that you may want to turn into managed placements. Targeting with keywords will be more familiar to advertisers who have had some experience with the Search Network. You can adjust bids at the keyword level, allowing for granular management and, with the exception of engagement bidding (CPE) you can use all other bid strategies. 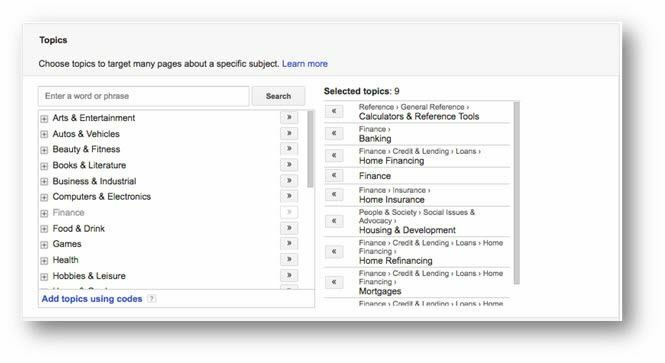 If you are targeting keywords and placements, your ads will appear only on placements you've chosen, and only on pages within those placements where the content matches your keywords. Read more about Display Network Keywords by clicking the link. The ‘Target and Bid’ option allows your ads to show only on pages about your chosen topics but with the option to bid on them also. Using the ‘Bid Only’ option you can add your chosen topics so that you can specify bids for them, but still show ads when your other targeting methods match. All of your ads will be triggered based on the other targeting methods, however if you specify custom bids or bid adjustments for this method, your bid can be used when this targeting method matches an impression. If you have not selected, at the minimum, one method to "Target and bid," your ads will not show. Read more about Display Network Topics by clicking the link. 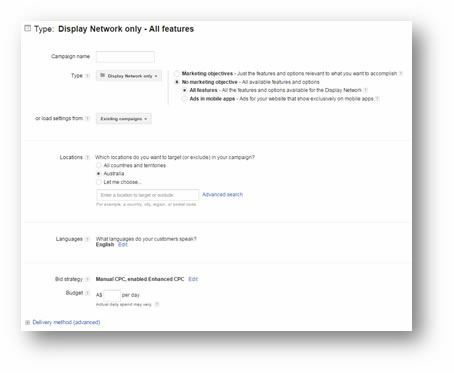 All ads on the Display Network appear on websites that are shown in AdWords as ‘Placements’, so no matter the targeting option you choose, you will always have Placement data. But you can also use Placements as a targeting option on its own, unlike all of the other options. Read more about Display Network Placements by clicking the link. Interests are served through audiences, the section below covers what audiences are and how the work. Read more about Display Network Interests & Remarketing by clicking the link. There are three types of audiences that can be used to target users based on their interests, we describe each one below in more detail. Read more about Display Network Audiences by clicking the link. Affinity audiences target users based on their interests and lifestyles. This is a good choice if you are looking to expand reach or drive brand awareness. For example if you were managing an account for a car manufacturer, you could target car-enthusiasts with this targeting option. Using the same technology and audiences as the above mentioned ‘Affinity Audiences’ you can customise this to reach highly targeted or more specific sub-groups of users. This is essentially a sub-set of the above audience type. In-market audiences target users based on whether they have recently shown intent to purchase a relevant product or service online. Google determines this through a combination of user behaviours such as clicking ads, converting, and the nature of content that they are viewing. This makes this audience great for targeting if you are after users who are3 more likely to convert. For example, if you were managing the account of a car manufacturer, you could target people looking to buy a car with this targeting option. There are many categories and sub categories to choose from in order to reach the right audience. Remarketing is a technique used to target users who have previously visited your website with relevant ads. Remarketing requires remarketing lists to work, in order to build these lists you will need to installed the remarketing tracking code on (typically) every page of your website. Remarketing lists can be built in a number of ways; you can define lists based on a set of criteria that a user needs to meet in order to be added to the remarketing list. An example of this could be users that visited a set of pages on your site and who did not make a purchase. You can then target these people with ads relevant to the pages they were visiting. If you have ever looked at a pair of shoes online and then seen an ad for those shoes follow you around the net for some time… This was likely a remarketing ad from that business. This technique allows you to plug the hole in your marketing or conversion funnel, bringing users who had dropped out back into the funnel. Hence this can be very powerful and highly effective, especially when ads are highly targeted. You could also advertise relevant products to users who made a purchase, for example; if a user buys a bicycle from your online store, you could later target that user with ads for a puncture repair kit or other bicycle accessories. We cover this topic in a lot more depth in our guide to remarketing. This targeting option is useful for advertisers who know their target audience demographics or who are targeting a specific demographic… If you are selling men’s clothes for example, there is an obvious demographic to target. Read more about Display Network Demographics by clicking the link. Exclusions are a way of limiting or ‘excluding’ things from your chosen targeting option… For example you can exclude specific placements (websites) in a comparable way the way in which negative keywords work. This enables you to tailor or customise your targeting, excluding criteria that are either irrelevant or are proven to be ineffective with data. We cover specific exclusions for each targeting option within the guide for that targeting option, so if you want to know about demographic exclusions, read our guide to demographics. Ad Extensions come at no extra costs, you will be charged for the Clicks but at no additional cost to what you would pay for a click normally. By providing additional information about your business, products, what your customers think, etc. 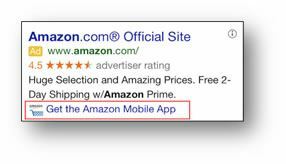 to searchers you can encourage people to click on your ads.